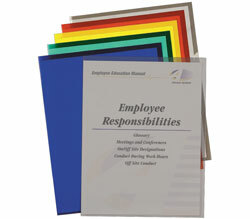 Great for customer leave-behinds, these see-through vinyl covers enhance every presentation. Red covers with matching 1/8 inch binding bars (backbones). Holds 8 1/2 x 11 materials. 50/BX.